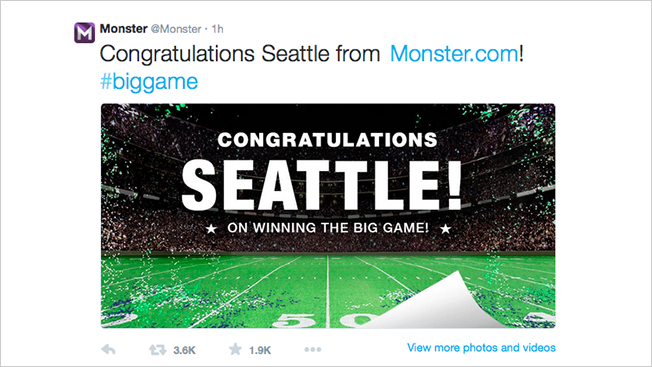 Faking out your followers on Twitter is quickly becoming a tired tactic for attention, but Monster still deserves a round of applause for its Super Bowl social stunt. BBDO New York worked with the job listing site (which wasn't a Super Bowl advertiser this time around) to create a tweet celebrating the Seattle Seahawks' victory. The problem, of course, was that the New England Patriots won the game 28-24 thanks to a last-second interception. In addition to sparking more than 4,000 retweets and 2,400 favorites, the stunt increased discussion of Monster by more than 1,500 percent compared to the average day, BBDO says.